As joint and muscular stiffness is a concern for aging adults, it is highly beneficial to continue participating in physical activities and exercise. The benefits provided by physical activity in an outdoor environment is believed to help reduce the risks of injury and chronic disease, while also improving confidence and mood state. The Assisted Recumbent Cycle is the perfect choice for any age, ability or physical shape, because it is a low impact exercise station that is easy on the knees, hips and back. The Assisted Recumbent Cycle Station is the top choice to use for the rehabilitation exercises that are necessary due to leg injuries and for individuals with joint issues such as arthritis. The detached design of this station features a comfortable, 18" wide contoured seat, back rest and a side assistance bar to help with entering and exiting. 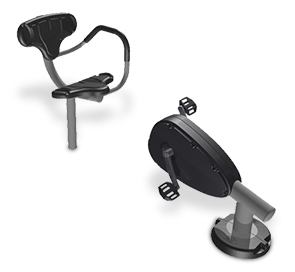 The recumbent bike uses magnetic bearings to dynamically adjust the pedal resistance based on the level of force generated by the user. This helps reduce the risks of overexertion and injury while maintaining effective strengthening of both leg muscle and cardio vascular health.